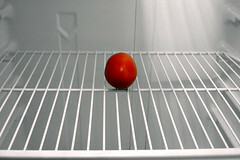 Cleaned out the refrigerator, including the usually-ignored door shelves. Discarded a crazy amount of half-used condiments, some dating all the way back to 2008. Reorganized the freezer and deep freezer. Pulled up the oldest items and forced myself to incorporate them into the week’s cooking. Put the things I tend to lose track of front and center. Sorted through all the drawers and cabinets in the bathroom. Forced myself to cull fifteen years’ worth of leftover prescription meds. Bought clear plastic shoeboxes and organized everything by category. This weekend I’ve put some stuff up on Craigslist and Freecycle, and I’m taking a pass through clothes and shoes. For his part, Jak sorted through a chunk of the random crap we have stored in the garage, and shuffled a full carload of our combined discards off to Goodwill. I fear this may be disappointing, given my emphasis on frugality, but getting the most possible money out of this is not our priority. The Purge Project is daunting and in most cases, ‘easy’ trumps ‘profitable’. I know from past experience that selling used things requires a lot of work. You have to take photos and edit them. Then you craft a Craigslist post or an eBay ad and put it up, sometimes several weeks in a row; you answer a lot of emails and arrange transactions, some of which fall through. Or you have to organize a full-scale garage sale, which is no easier. I don’t have the energy to go through all of that, and I know what would happen if I tried: I’d get overwhelmed and bail out with 90% of it still undone. What’s driving us both right now is not the money anyway, it’s the allure of a simpler existence. Our month in Mexico only fueled that existing desire; it was lovely to be so unburdened by Things. We are trying to keep as much as possible out of landfills, but if something is worth less than $20, we just give it away. Another thing I’m struggling with: not accumulating more unnecessary crap. Here’s an example. Last week I read in a blog about a local (eastern Washington) farmer who sells fruit in bulk. On his web site, he has Rainier cherries for $3.25 per pound … if you buy 15 pounds. 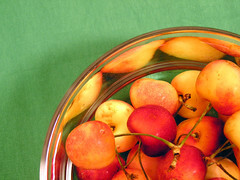 I adore Rainier cherries. They might just be my favorite fruit ever. But I doubt that even I could eat 15 pounds of them before they spoil. So okay, I would need to freeze some. I’ve never frozen cherries, but the Interwebs tell me I should pit them first. Except I don’t have a cherry pitter! Except I don’t. Need one more thing, that is. A free thing you don’t need is just something else to get rid of. I went by Fred Meyer earlier this week, and I did spend time looking at the gadgets, but I forced myself to walk away and think about it for a while longer before buying. Later I read through Amazon reviews for mango splitters and cherry pitters. That flung a dash of cold reality onto the situation, because the reviews for mango splitters were not encouraging. The concept just doesn’t seem to be that sound — too many people reported smushed mangos, or mangos too small or large for the tool. I decided, reluctantly, that I should either pit mangos with a knife or do without. I went back to my old tried and true pitting tool … a paper clip. Just insert the clip where the stem was, push it down and under the pit. Insert the double loop side into the cherry, so the inside loop helps lift out the pit. Then scoop/pull/flick the pit back up through the stem hole. Below that were several comments from people who’d attempted the paper-clip pitting with great success. I haven’t tried it myself, but I will … just as soon as I get my hands on some cherries. In the meantime, I have managed to talk myself out of getting any more kitchen gadgets. The Rainiers, though, I’m still considering. If anyone in north Seattle wants to split a 15-pound box, let me know. I could use some as well (LOVE Bing cherries! ), but I am out of the city until July 7. When do you plan to buy them? ‘When’ is somewhat flexible. I haven’t been able to connect with Josh (above) and haven’t pulled the trigger yet. Why don’t you contact me when you’re back in town and we’ll see? Woops, I skipped over the ‘Bing’ part. I am looking to buy Rainiers in bulk (I like Bings too, but I think Rainiers are better). Any interest in those? I am in town :-) Still on for the cherries deal? Using a paperclip to pit cherries. Been there done that, my sister watched me do a massive amount for pies one day and my next birthday I was given a stainless steel pitter… funny thing is, I have used the thing once, a paperclip works better. You get covered in juice and everything around stained red and stick with either. Try to pit into a deep bowl or pot to contain the splatter. Thanks for the confirmation and the tip! I don’t think you need to buy 15 lbs…I got Rainier Cherries yesterday for something like $2.99/lb (it might have been less but I didn’t write it in my price book!) at Top Banana produce stand at the corner of NW 65th and 15th NW in Ballard. Ha. I’ve never seen a multiple-cherry pitter; I wonder if it works or if it’s just overcomplicating things. I’m familiar with Top Banana and I like them, but where we live now, it’s about nine miles round-trip — way farther than I ever drive for groceries. That’s about … $1.30 or so in gas, which means I’d have to buy at least five pounds of cherries just to break even! Plus I’m kind of a sucker for the whole straight-from-the-small farm thing. Thanks for the encouragement! I’m afraid I do still buy a few things new — I’m building a cookware set with very specific individual pieces of high quality, and while I would love to buy them from Goodwill or Craigslist, I’ve had no luck finding what I need.